About a month ago I reached 300 followers and decided to buy a few things for a giveaway to say thank you to all the lovely people who read my little blog. It’s overwhelming to me that there are 350 of you that want to read what I put up here, and I’m enormously grateful. Since I started gathering some goodies I have now crept up to 350 followers, and I finally have some things ready to be given away to a lucky reader. 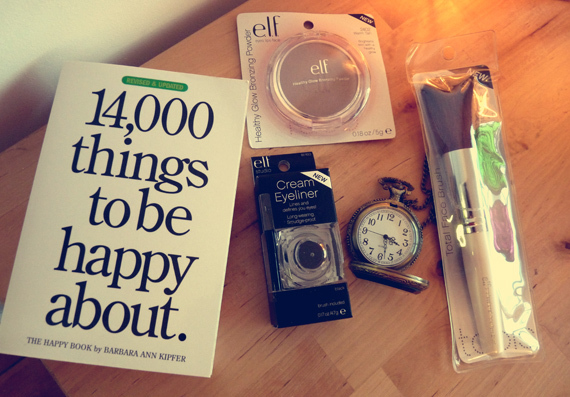 The prize contains a lovely book, ‘14,000 things to be happy about‘, the total face brush, cream eyeliner and bronzer from Elf, and a gorgeous little vintage style (working) pocketwatch necklace. You have to be a follower of this blog. Comment on this post, telling me one thing that makes you happy (and leaving me a way to contact you if you win). A tweet about this giveaway will earn you another entry. Just tweet “Check out Rosie’s (@rosieoutlook) 350 followers give away at http://tinyurl.com/6laje47” – and then leave me another comment to let me know you’ve done it. The winner will be chosen via a random number generator. The giveaway closes on Sunday 10th July at 10pm. Hooray!